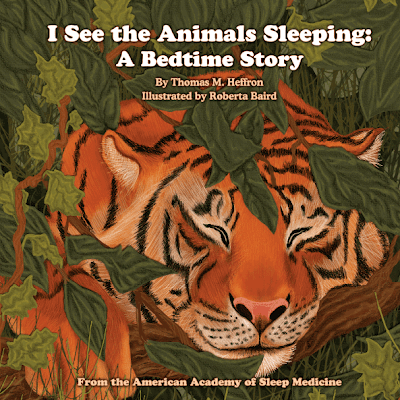 The Sleep Education blog invited Vicki Rakowski to review I see the Animals Sleeping: A Bedtime Story, a children’s picture book published in 2011 by the American Academy of Sleep Medicine. Vicki is assistant director of youth services for the Lisle Library District in Lisle, IL. How does a lion sleep? A red fox? How about an elephant? With this new title from the American Academy of Sleep Medicine, young readers will learn exactly how their favorite animals go about getting their rest. The information is delivered simply – charmingly illustrated scenes of sleeping animals and their habitats juxtaposed with a four-line rhyme and a fact box. From flamingoes to platypuses, the scenes are elegantly done, but never overly arty -- it’s impossible not to smile at illustrator Roberta Baird’s rendition of a dozing sea otter. The “Sleep Fact!” boxes offer lots of points for discussion -- the differences in the ways many animals prefer to sleep, as well as their ideal habitats, and wonderful details about the animals themselves, but this information is never overwhelming. While the majority of the rhymes are pitch-perfect for both the audience and the subject matter, readers may find themselves stumbling here and there over a few forced lines. This book, however, offers solid, engaging nonfiction for toddlers and preschoolers about one of their favorite subjects: the animal kingdom. This makes a great addition to any children’s collection, and will be a terrific support to early childhood educators in their lesson plans and circle time. Recommended for toddlers and preschoolers.